PHOTO BY PAT GAIETTO Hopewell-Loudon’t Caden Crawford (above) works against Cory-Rawson’s Tyler Stoodt in the 126-pound final at the Blanchard Valley Conference Championships in Bascom. Crawford won by pin. BASCOM — Three Hopewell-Loudon wrestlers won titles and two others also placed Saturday to lead the Chieftains to fifth at the Blanchard Valley Conference Championships. Van Buren powered past Liberty-Benton 153 1/2-147 1/2 for the team crown. Arcadia upended McComb 90-80 for third, and the Chieftains edged Cory-Rawson 77 1/2-75 for fifth. North Baltimore (74 1/2), Riverdale (43) and Pandora-Gilboa (8) rounded out the standings. Hopewell-Loudon’s three titles came in the first four finals, each via pin. Blake Hoover flattened L-B’s Riley Peterson (1:20) for the 106-pound crown, Kole Freeman stuck Van Buren 113-pounder Grant Young (5:57) and 126-pounder Caden Crawford stuck Cory-Rawson’s Tyler Stoodt (1:53). 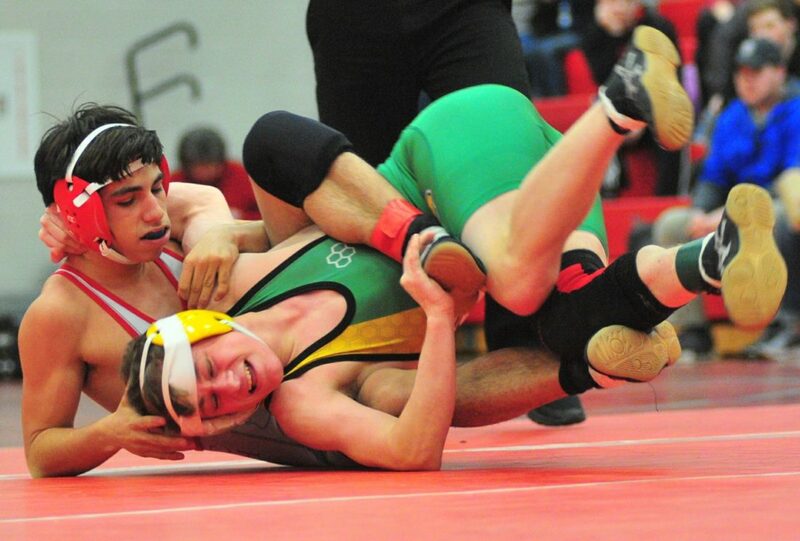 The Chieftains also got fourths from 132-pounder Logan Bloom and 170-pounder Caleb Hinton. Liberty-Benton’s Dru Baker scored a 13-1 major decision against Bloom, and Hinton fell 6-0 to Arcadia’s Kenneth Durst. CAREY — Noah Clary was named the outstanding wrestler and was one of six title winners for Upper Sandusky en route to leading the Rams to the Northern 10 Athletic Conference Tournament title Saturday. The Rams upended Mohawk 189-175 for the team championship, followed by Bucyrus (89 1/2), Carey (74 1/2), Seneca East (41 1/2), Buckeye Central (17) and Ridgedale (10). All 14 weight classes were contested in round-robin format, with none having more than six competitors. Clary took the 182-pound crown by beating both of his opponents, scoring a pin against Mohawk’s Grant Theis (2:55) and beating Carey’s Tanner May 7-4. Upper Sandusky also got titles from 113-pounder Ronan Gullifer, 120-pounder Ashton Shepherd, 126-pounder Brayzin McDaniel, 195-pounder Mitchell Dewitt and 220-pounder Connor Johnston. Seconds went to Caleb Payne (106), Emery Paul (132), Arik Schneider (145) and Brandon Derr (170). Garrett Thomas (138), Blake Herbert (160) and Mark Collins (285) each added a third, with Jesse McLane (152) also turning in a fifth. Mohawk also had six champions and four runners-up. Titles for the Warriors went to 106-pounder David Daniel, 132-pounder Daniel Price, 145-pounder Morgan Price, 152-pounder Rico Lopez, 160-pounder Ian Pursell and 170-pounder Parker Brown. Mohawk’s runners-up were Caden Gurney (126), Jesse Leeth (138), James Clouse (195) and Nick Theis (220). Grant Theis (182) added a third for Mohawk. Carey’s Ethan Schalk had the area’s only other championship, taking the 285-pound title. Reece Mullholand (113) and Tanner May (182) each added a second for the Blue Devils, with thirds coming from Kadin Smiley (106), Shawn Secresty (126) and Hayden Jacoby (152). Fourths went to Trent Eggert (132), Jaden Pahl (145) and Trent Pheonix (195). Drake Schwochow (138) and Kaeden Wentz (170) both took fifth for Carey and Noah Black (220) came in sixth. Seneca East got thirds from Dakota Laughlin (132), Wyatt Sanders (145), Rickie Lacy (170) and Bock Martin (195), with Brandon Best (220) adding a fifth. Fourths for Buckeye Central came from Davey Williams (138), Michael Omlor (220) and Chris Acevedo (285). Jacob Maxhimer (195) took sixth.